Hair: Below shoulder brown hair (ponytail), goatee beard, light moustache. Numerous tattoos on upper torso and arms and scars from vehicle accident. The missing person was last seen when his employer dropped him off at the Gepps Cross Hotel, Main North Road, Blair Athol. His disappearance has been described by family members as out of character. Adelaide police are trying to find the former president of the Gypsy Jokers motorcycle club, who has been missing for several days. Steve Williams was last seen at the Gepps Cross Hotel on Tuesday afternoon. Detectives are examining his car, which was left at the hotel. Senior Constable Colin Haigh is urging anyone with information to come forward. "He has not contacted family since, which is out of character for him," he said. Police are asking anyone who has information about the man's whereabouts to contact Crimestoppers on 1800 333 000. THE heartbroken teenage daughter of missing former Gypsy Jokers bikies boss Steve Williams wants her dad to return home for his birthday this week. Blayze Williams, 13, said yesterday she did not know where he was but did not want to face the prospect that she may never see him again. Her only wish was that he be with the family for his 39th birthday on Wednesday. "We need him back," she said at her mother's northern suburbs home yesterday. "We want him back for his birthday. "I was supposed to stay over at his place (in the city) that night to give him his presents. "It would be mine and his birthday wish that we could spend it together again." Mr Williams, 38, has not been seen since Tuesday when his boss dropped him at the Gepps Cross Hotel at 2.30pm. His white Ford Falcon was later found abandoned in the hotel car park. It is unknown why the car was parked at the hotel or how it came to be there. Mr Williams has not been answering his mobile phone or made contact with relatives, which has been described as out of character. He resigned as president of the Gypsy Jokers club about 14 months ago. He recently criticised the SA Police anti-bikie taskforce Avatar following the clash between the Hells Angels and Rebels bikie clubs – in which shots were fired – at an Adelaide Dance Music Awards night. Blayze last saw her dad on Monday after spending the Queen's Birthday long weekend with him "hanging out", watching movies and taking "a few drives". He was due to pick up his girlfriend, Alena Skipper, and then deliver a laptop computer to Blayze on Tuesday. He never turned up. Blayze said his disappearance had been particularly hard to deal with because she spoke to him every day. "I'm sort of in shock," she said while being comforted by her mother, Kim Asling. "It still doesn't feel like it's happened. I still think I'm going to wake up but I'm not. "Even if anyone sees him, can they just report it? Even if they make it anonymous, it might help." Blayze and Ms Asling, Mr Williams' former partner, were interviewed by detectives yesterday. "People might just think `another biker' but they don't associate him as a family man – and he was a good family man," Ms Asling said. "He was a good man and a good dad." Police say that at this stage the inquiry is being dealt with by Holden Hill CIB as a missing persons investigation. "Given his history police are clearly concerned for his welfare and safety," Chief Inspector Peter Graham said. "But in the absence of any information to the contrary, it is being treated as a missing persons inquiry. "Holden Hill CIB, who are conducting the investigation, have liaised with the Avatar taskforce. Avatar have been consulted because of their knowledge of Mr Williams' association with motorcycle gangs." Mr Williams' white Ford Falcon remains at the Holden Hill police station compound. The lock on the boot appears to have been forced open. A sign on the car says: "Do not touch for forensic examination." A police spokesman said the vehicle would be forensically tested tomorrow. Blayze said her father's disappearance was out of character. "He always called to say he couldn't make it, he can't come out," she said. "He is the best. We always did stuff together and he loves it when I come over." Blayze, a keen horse rider, said she had been spending more time with Mr Williams' favourite horse, Homer, named after his favourite TV character in the TV show, The Simpsons. "When dad would come to (horse) shows he always cuddled him and would give him a kiss," she said. "They had a bond." Staff at the Gepps Cross Hotel yesterday declined to comment on Mr Williams' disappearance, citing "hotel policy". At Mr Williams' former bikie club HQ at Wingfield, a club member asked a Sunday Mail reporter to leave. Mr Williams is 185cm tall, about 100kg and of muscular build with long brown hair, normally pulled back into a ponytail. He has a light brown moustache and goatee beard with numerous tattoos on his upper body and upper arms. Anyone with information is urged to call BankSA CrimeStoppers on 1800 333 000. Police say all information will be treated in confidence. FORMER Gypsy Jokers Motorcycle Club president Steven Williams has disappeared and police have not ruled out foul play. The 38-year-old was last seen on Tuesday afternoon at the Gepps Cross Hotel. His car was found abandoned in the hotel's car park. Mr Williams has not contacted his family, which police say is out of character. Police are investigating his disappearance and have impounded his car for forensic testing. Mr Williams stood down as president of the Gypsy Jokers last year. Just last week he spoke to The Advertiser about problems with SA Police's bikie unit, Avatar. "If Avatar didn't know the Hells Angels and Rebels are in the same place when alcohol is being consumed and there's a fair chance something will happen, their intelligence isn't very good," he said. It is believed many bikies were angered by his comments. Mr Williams is described as 185cm tall, 100kg with a medium build. He has short brown hair which is usually pushed back into a ponytail and a light brown moustache and goatee. He has many tattoos. Anyone with information about his disappearance is asked to call Crime Stoppers on 1800 333 000. POLICE are hunting a possible suspect over the disappearance of former Gypsy Jokers motorcycle club boss Steve Williams. They are following information he may have been the victim of foul play. The Advertiser understands police interviewed a Woodville West man on Saturday after he told police an associate had confessed to killing Mr Williams. Police sources said the man was "convinced" the information and identity he provided were genuine. Several patrols yesterday visited an Osborne address to speak to a possible suspect but no one was at home at the time. Mr Williams' early model white Ford Falcon will be forensically tested today. It was abandoned at the Gepps Cross Hotel where Mr Williams was last seen about 2.30pm on Tuesday. He was reported missing about 3pm on Thursday by partner Alena Skipper after he failed to contact her and missed a visit with his teenage daughter Blayze, to whom he spoke on a daily basis. Blayze, 13, at the weekend made an impassioned plea for anyone who might have seen her father to contact police. "If anyone sees him, can they just report it? Even if they make it anonymous. It might help," she said. Mr Williams, who turns 39 on Wednesday, is renowned for speaking out against police and government in defence of motorcycle clubs. That is a move not supported by many in the biker fraternity used to dealing with issues behind club doors and with a code of silence. Mr Williams is embroiled in a legal battle with members of the police STAR Group. They are suing him for damages for injuries they claim to have sustained in the Beachport brawl in the 2001 Gypsy Jokers' club run. Holden Hill CIB is investigating various leads. Detectives have spoken with friends and family of Mr Williams. Police say until there is evidence to the contrary, the investigation will continue on the basis Mr Williams is a missing person. He is described as being 185cm tall, weighing about 100kg and of medium build. 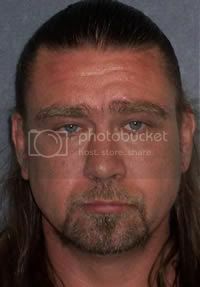 He has long brown hair, usually worn back in a ponytail, a light brown moustache and a goatee beard. He has numerous tattoos. THE disappearance of an Adelaide bikie has been declared a major crime but detectives are calling on him to contact police if he is safe and well. Steven Williams, once the leader of the Gypsy Joker gang in South Australia, has not been seen since Tuesday last week when he was dropped off at a suburban hotel. His car was later found in the hotel car park. He was reported missing by his family on Thursday and police said today it was out of character for the 38-year-old to go so long without contacting relatives. "We appreciate he has only been missing for a short period of time but due to family concerns his disappearance has been declared a major crime," said Detective Superintendent Peter Woite. "We are erring on the side of caution and we would ask Mr Williams to contact us if he is safe and well." Often outspoken in the defence of motorcycle clubs, Mr Williams was last year ousted as the leader of the Gypsy Jokers and later handed in his club colours. He is about 185 centimetres tall, weighs about 100 kilograms and has his brown hair pushed back and worn in a pony tail. He has numerous tattoos on his upper arms and chest. South Australian police are stepping up their search for missing former motorcycle club leader Stephen Williams, whose disappearance has been declared a major crime. Mr Williams, 38, was reported missing by his partner last Thursday, when he failed to return home. His car was found abandoned at the Gepps Cross Hotel and was forensically examined today. Detective Supmissing bikie 2erintendent Peter Woite says his family is concerned for his welfare. "At this point in time it appears for Mr Williams to be missing for this period of time and due to the family concern, we take that into account," he said. "We are declaring the matter [a major crime], which then enables us to put in extra resources, to look into the disappearance." DATE:- Friday 28th October 2005 Time:- 11.00 a.m.
As a result of that call Major Crime detectives conducted a search of the premises of a Trucking Company at Gilman. As a result of that search a number of other inquires are being conducted. For operational reasons I cannot at this time expand on those inquiries. so that a Major Crime investigator can speak to that person. We believe that the information that person has is crucial to the investigation into the disappearance of Steve Williams. Anyone with any information in regards to the disappearance of Steve Williams is urged to contact BankSA Crimestoppers by phoning 1800 333 000.